Da Couch Tomato: The Vampire Diaries. Season 4. 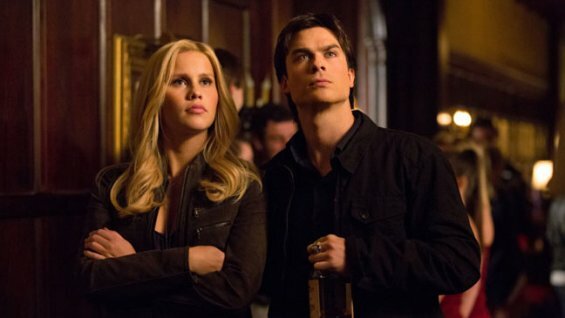 Episode 16: "Bring It On"
The Vampire Diaries. Season 4. Episode 16: "Bring It On"
Look at these two stare. Elena is differentiated from Katherine again. The doppelgangers are now both vampires, one more manipulative than the other. The less manipulative one is spiraling down the non-feeling staircase, even sliding on the rails. Elena is doing what she wants and even tries to kill Caroline! And it turns out she's not sired to Damon anymore because she turned off her humanity, ergo, she's not feeling it. So how does one turn on humanity again? How do you make someone care? Finally, our dear hybrid gets some action in his bed... with Haley, who is still obsessed with finding her parents. It's not as hot as Elena and Damon's bed scenes. Klaus's style is more animalistic, I guess. Haley being a werewolf could have also contributed to that. That said, I don't fancy them together at all. Damon has a lead in finding Katherine, who has the cure. Cue the flashbacks. And Rebekah would be right on his tail.